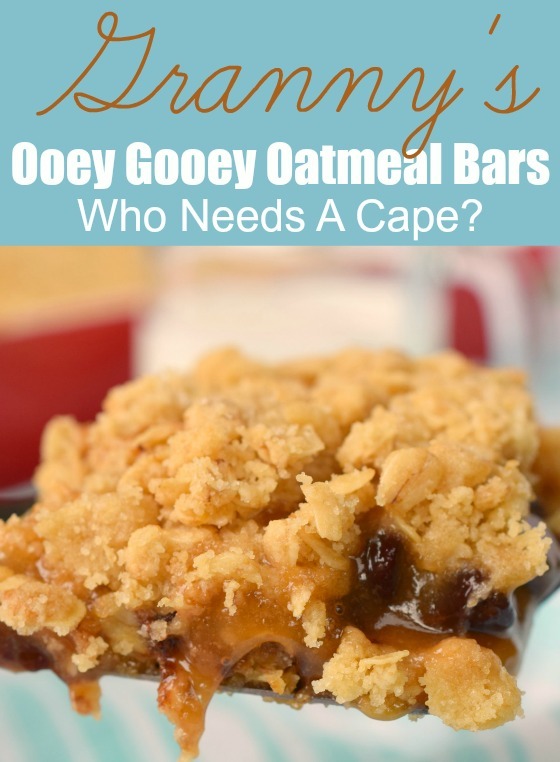 Granny's Ooey Gooey Oatmeal Bars - Who Needs A Cape? 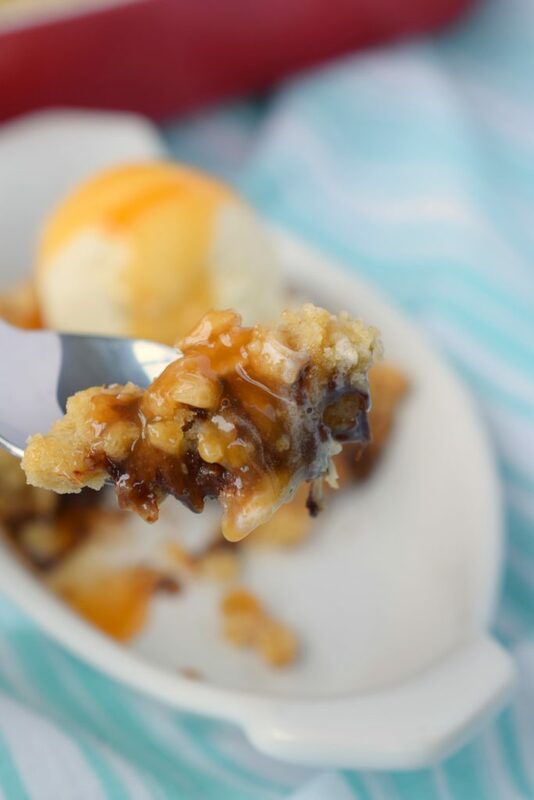 Granny’s Ooey Gooey Oatmeal Bars are a decadently easy dessert. 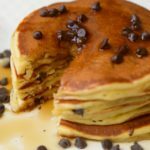 With caramel and chocolate sandwiched between sweet oatmeal layers, they are delish. 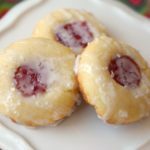 We’re taking a stroll down memory lane today with some of our blogging friends and sharing Grandma’s Favorite Recipes! Memories of some of our favorite recipes from Grandma, Granny, or Nanny. Whatever you may have called this beloved family member most can agree that there’s a recipe or two (or even more if you are fortunate) that will bring back the nostalgic memories of her cooking, baking and time in the kitchen. 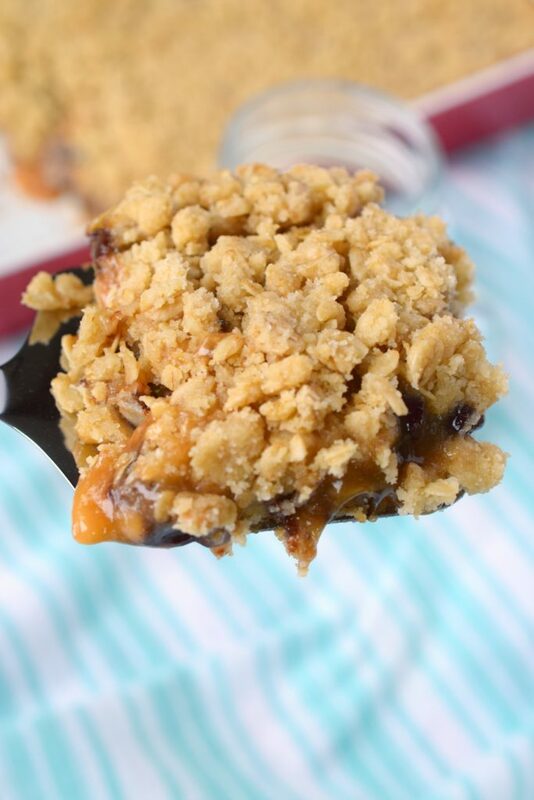 I’m sharing Granny’s Ooey Gooey Oatmeal Bars as my contribution to this collection. 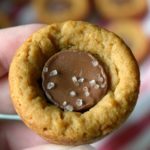 I only have one actual recipe that is from my grandma, a cookie recipe which I really need to get onto the blog. When I started thinking about what I really remember my grandma making when I was young I remembered a layered bar which had a center with caramel and chocolate. This recipe is pretty darn close to what I recall devouring as a youngster. This recipe makes a large batch, which is great when you are serving during the holidays or taking to a potluck. If not, find a friend, give them away…your waistline will thank you. 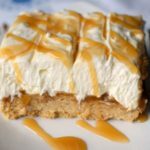 I took Granny’s Ooey Gooey Oatmeal Bars to the next level by serving them with a scoop of ice cream on top and a drizzle of caramel sauce. Holy yum! 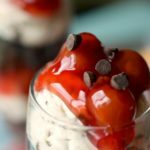 Now that I’ve tempted you with this sweet treat, I’m excited to share with you all the other delicious recipes from my blogging friends. 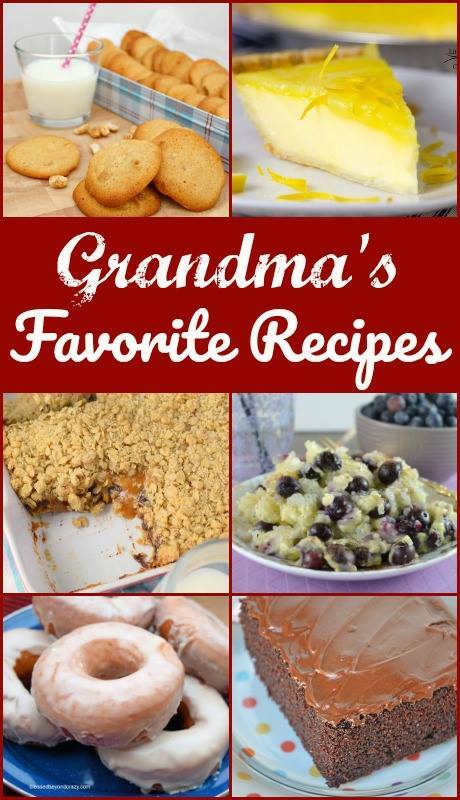 Granny knows best and we just know you’ll love trying all of these memorable recipes! 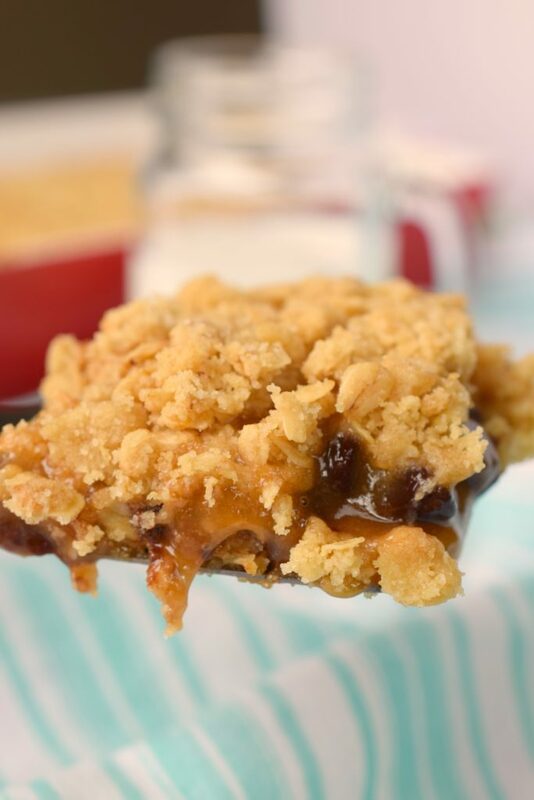 Granny's Ooey Gooey Oatmeal Bars are a decadently easy dessert. 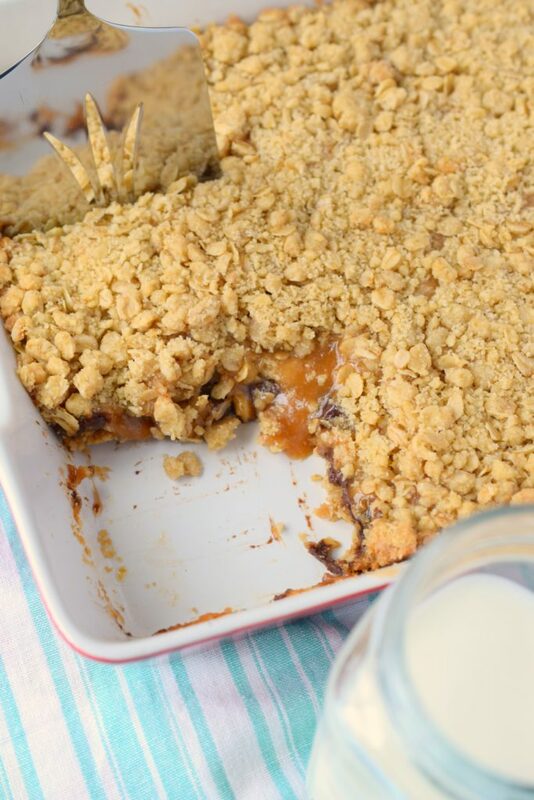 With caramel and chocolate sandwiched between sweet oatmeal layers, they are delish. In large bowl combine: flour, oats, sugars, salt, & baking soda. Stir in vanilla extract and melted butter. Press half of mixture into prepared baking pan, reserve remaining mixture. Remove from oven and immediately sprinkle on chocolate chips. In small bowl combine caramel sauce & flour thoroughly. Pour caramel sauce over top of chocolate chips. Sprinkle remaining crust mixture on top of caramel sauce, pressing down lightly. Bake 15 minutes. Allow to cool completely prior to cutting. Oh wow! Who can resist the combination of oats + caramel + chocolate all wrapped up in an ooey gooey bar?!?!?! This caramel is just to die for! I’m a sucker for it each and every time! I have everything to make these right now. I really need to head into the kitchen to make these so I can devour them! Please forgive me if I don’t share! Oh my word these look good. Perfect for a picnic too I say! 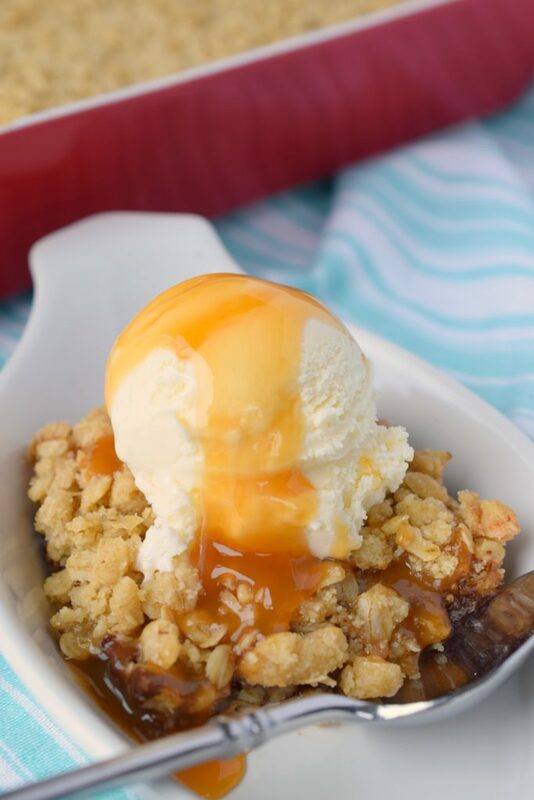 Love all that ooey gooey-ness! Looks like the perfect treat to cure a sweet tooth! 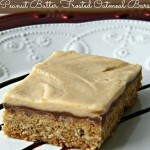 These Ooey Gooey Oatmeal Bars look to die for! So yummy! Wow, these Oatmeal Bars looks incredible!